The land where the sun is reborn every morning and the new dawn is greeted by the rituals of countless samurai warriors, preparing themselves for another glorious battle. The land where the twilight is saluted by the roar of the Oni legions and howls of the vengeful spirits. The land where the balance between good and evil blurs at the whim of the Kami… and the will of legendary champions. This week we take you to the shores of the rising sun, the sky-piercing volcanos, and endless cherry tree forests and introduce you to the Japanese mythology in World of Myths – brimming with mysticism, fascination and a smidgen of weirdness. 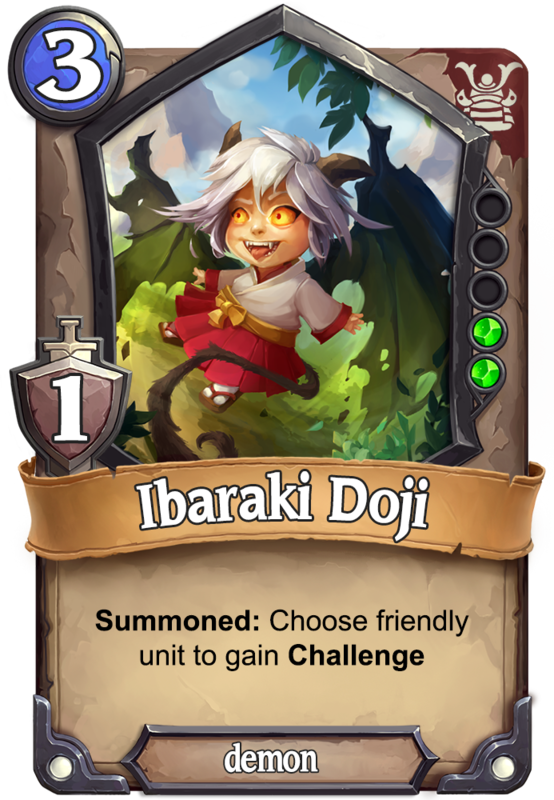 Stand up and rally, loyal warriors and powerful yōkai on your conquest to victory and find your way to the Floating Bridge of Heaven. When the fate of the Empire is at stake, you have no choice but to gather the most powerful warriors at your side. The samurai warriors were as skilled as they were honorable and having them within your ranks may be crucial for success. 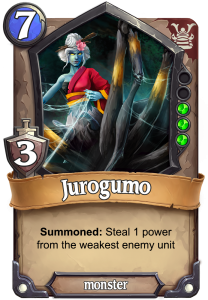 The samurai support each other in combat and possess the ability to Challenge even the most fearsome monsters to a duel! 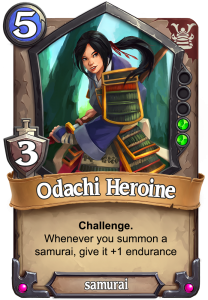 The Challenge ability [While attacking alone, only one defender can be declared] of Odachi Heroine allows your opponent either defend with a single unit or let her win the battle uncontested. This ability makes the samurai formidable opponents and your foes would have to think twice before crossing swords with you on the battlefield. 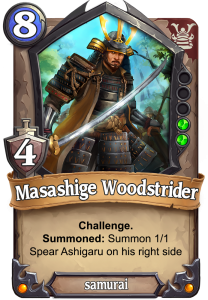 The great general Masashige will be there, marching forward with your army and slicing through the enemy lines to reach the opponent’s temples. 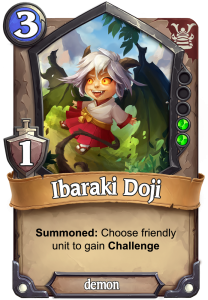 The powerful samurai champions can be a bane for the enemy forces, but if your rival has a strong hero to answer the challenge, you can get in trouble. That is why you would need ways to chip away the enemy units’ power and keep your mighty samurai warriors unbeatable. 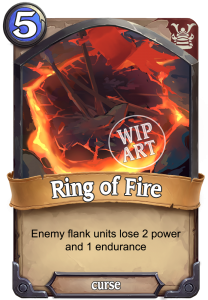 One way to do that is to unleash damaging curses upon your foes, such as the Ring of Fire curse. You set ablaze the opponent’s flanking units and reduce their power significantly, potentially leaving them weak and unable to answer your challenge. 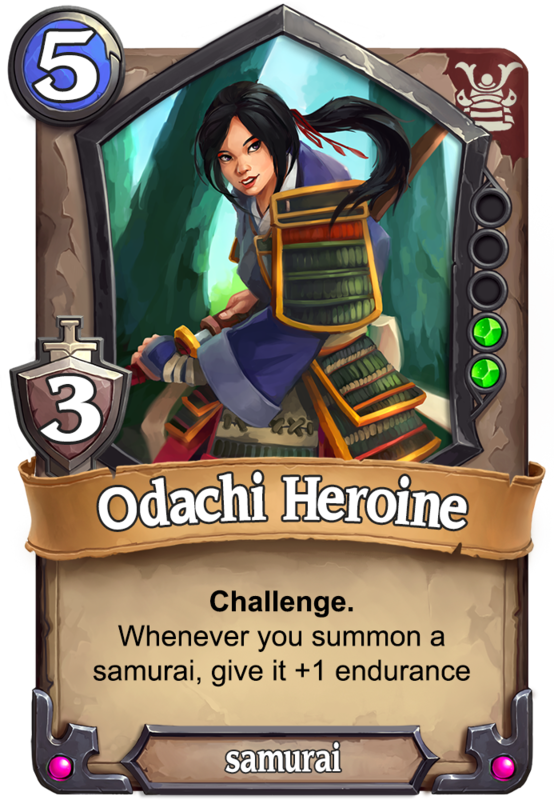 The samurai in World of Myths can help you cut down your opponent and ruin their temples with effective tactics and honorable battles. When you fight before the eyes of the gods and your Emperor, losing is never an option – you win the fight or you lose all. “The only thing to fear is fear itself… and Japanese ghosts!” The name of the author of this quote may escape you, but the name is not that important. What matters is, that the phrase is so very true. In the Japanese mythology, there are spirits everywhere – in the trees, in the stones, in the rivers, even in your household objects. A lot of scary Japanese yōkai can be found in the myths and legends of ancient Japan, many of which you can attract and recruit at your side. Call forth powerful demons, who will smash the enemy to bits or use tricks to buff your units with occult power. 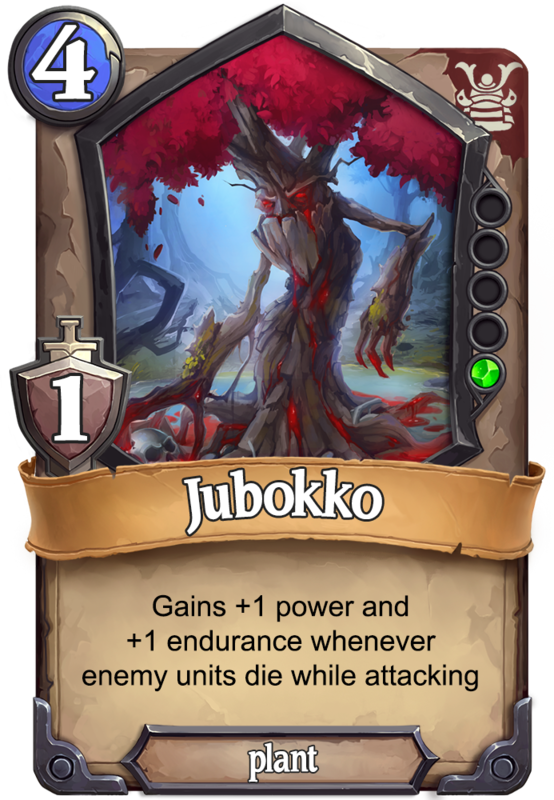 Or perhaps lure your enemies to the depths of your darkest forests and ambush them with terrifying monsters who will peel the skin from their bones, becoming even stronger or seduce the feeble-minded and drain their power. 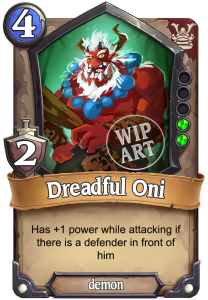 The demons and spirits are very diverse and versatile and provide you with many ways to obliterate the opponent’s units and leave your enemies petrified with fear. The fertile islands were home to a staggering variety of creatures and keeping the balance in such a crowded place was not an easy feat. This task lies on the shoulders of Amaterasu – supreme goddess of the sun and light and protector of all creatures in Japan. When it comes to a fight, she wants to see everyone contributing to the cause and that is represented by her ability – she blesses every unit with a new Trait that you summon to the battlefield. 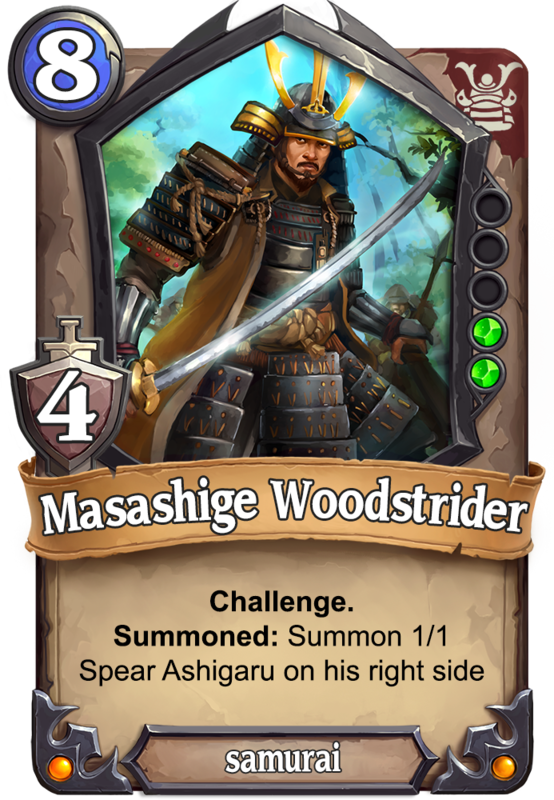 If there is no other samurai on the field when you play Masashige Woodstrider, he can turn into a nightmare for your opponent in just a turn. 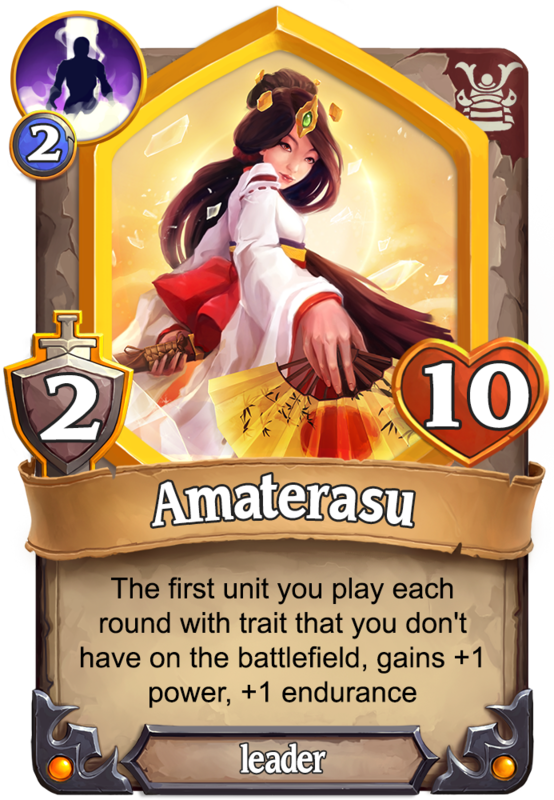 A good way to use Amaterasu’s ability is to include in your deck and summon units with different traits. 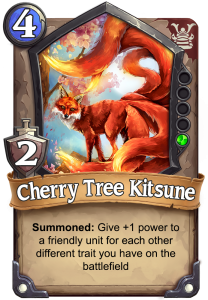 One of the mystical creatures in the Japanese mythology – the insightful Cherry Tree Kitsune – can benefit further from having unit with different traits on your side of the field. 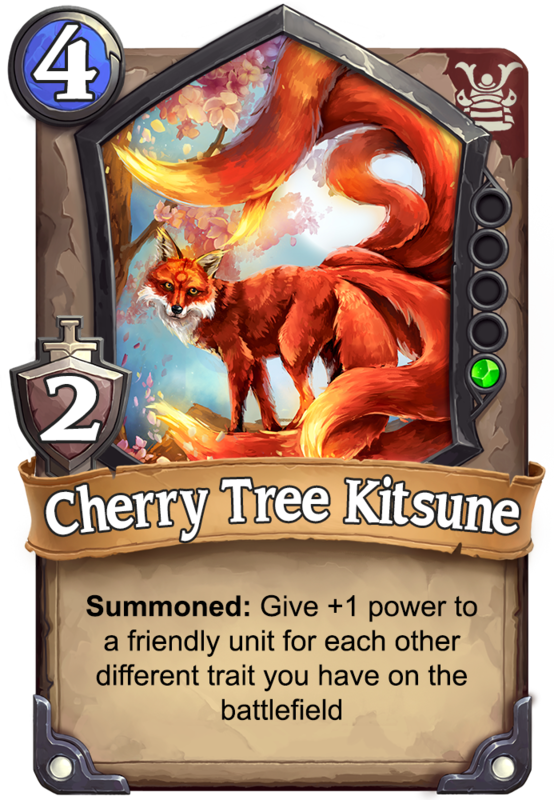 Kitsune can gain knowledge about the different types of creatures in your ranks and empower other creatures by sharing this knowledge with them, thus synergizing with Amaterasu’s ability. Many of the Japanese units are formidable when they attack alone. A number of ways to build a strong single unit will be available to you. 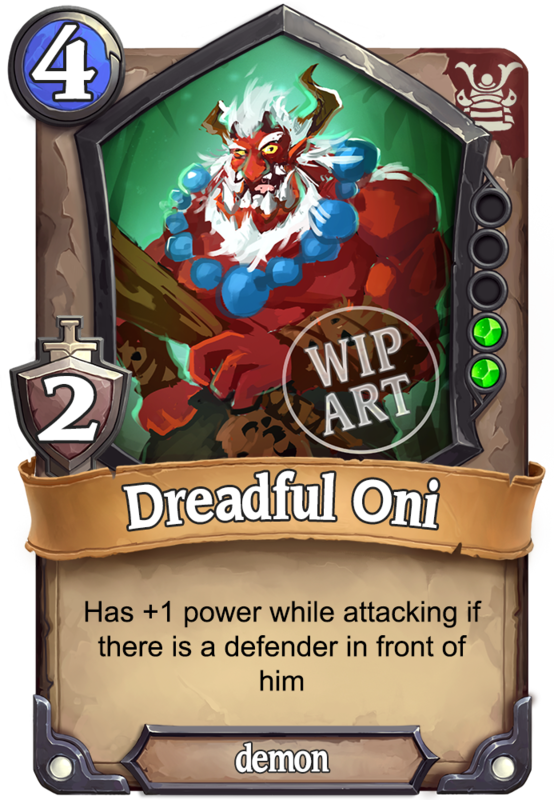 In the same time, you would be vulnerable if this unit is disabled in any way or killed by a card effect, the effort would be in vain – you will need to have your strategy figured out and prepared for any potential threats that would sap your strong units. Chose honor or strike fear in the hearts of your opponents – both viable options should you decide to join World of Myths on the side of the Japanese mythology. Fighting on the side of Amaterasu is for those who enjoy more open deck building options and are always looking for the value plays. If you don’t mind inviting strangers into your ranks and recruiting some mercenaries for your cause, take your place beside the Goddess of light and show your opponents the strength of unity. 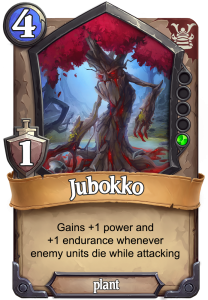 Sharpen your blade and summon terrifying spirits to haunt your foes – they are on your turf now and they will see the sunset, but you shall be the one to see the next sunrise.